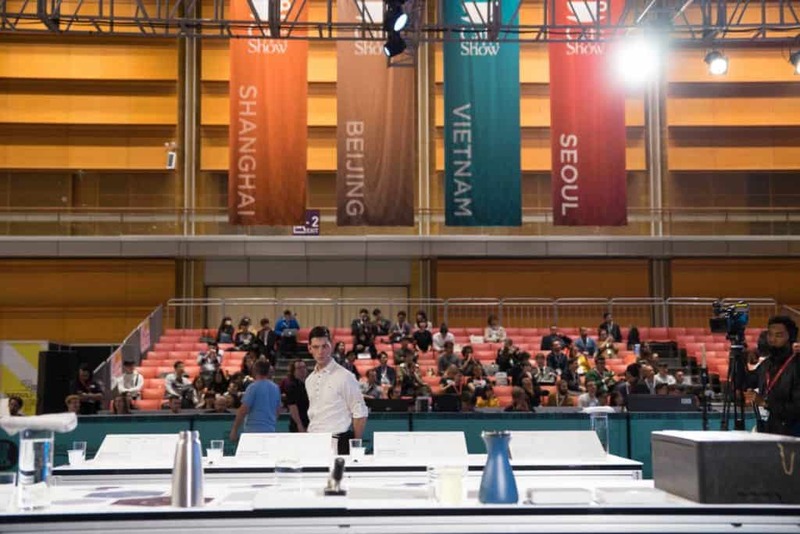 Early Saturday in Seoul, South Korea (and shortly after 1 AM CET) 16 competitors that got through to the semi-finals of the World Barista Championship 2017 began their second rounds of presentations. 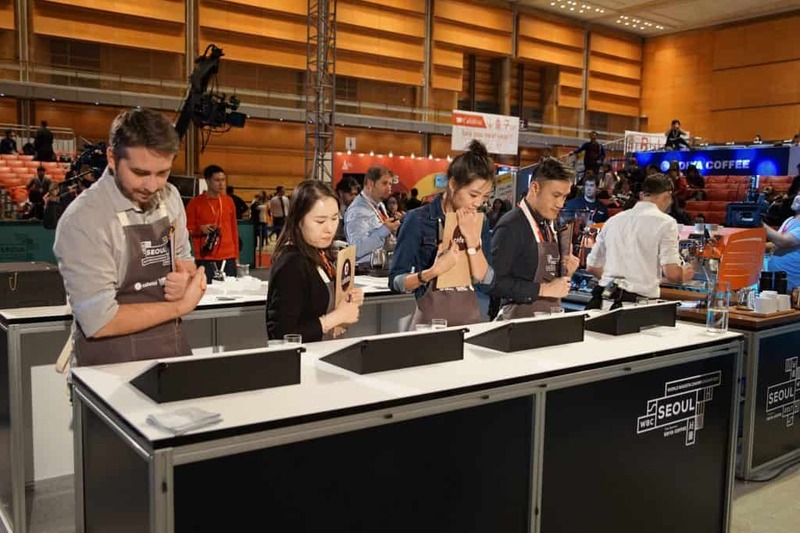 All competitors brought incredibly well-structured presentations, packed with information and coffee knowledge from the farm, of roasting, and brewing. They were all innovative and entertaining. 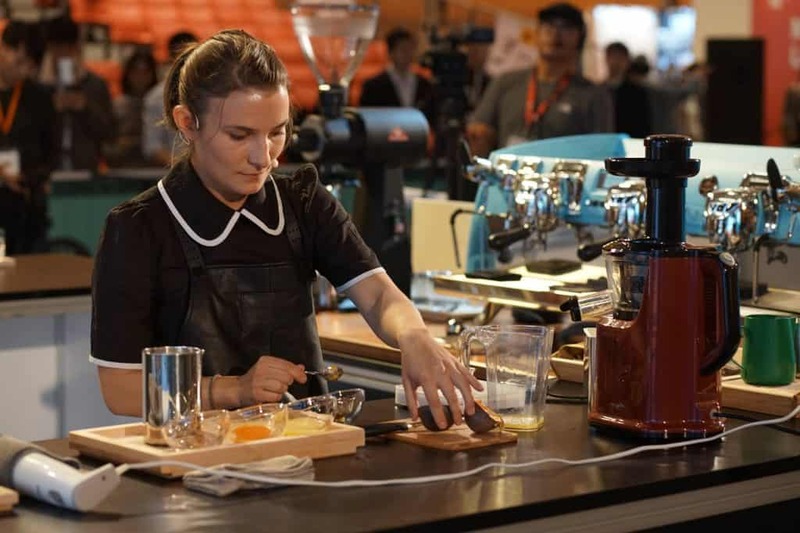 Once again, we had a close seat in the audience thanks to Victoria Arduino—the official sponsor of coffee machines this year—and Volcafe Select. In our following recap, we focus on the European competitors who did us very proud by getting into the semifinals, and whose presentations we tried to sum up for you. You can still watch their work on the online stream and also tune in for tomorrow's finals! Dale’s presentation was about building the context which he could put the coffee information into, for the customers to better understand and appreciate what he is delivering to them. 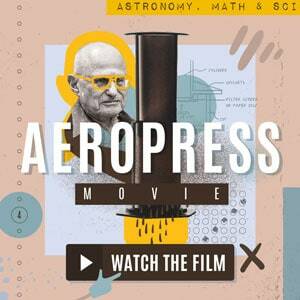 He presented his coffee with a demonstration of 10 key aromatic compounds that were found in his specific roast. 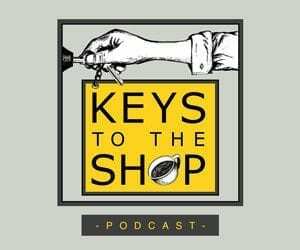 He found the key elements by comparing his chosen coffee to multiple roasts, brew methods and grind sizes of the same bean. The 10 compounds are explained during the presentation in relation to the flavour they illustrate and how does it translate into the cup. 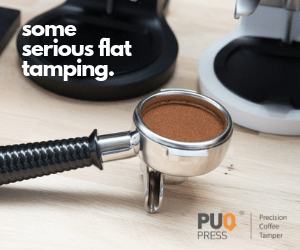 For example, one of the compounds found in espresso carries aromatic compounds which, in combination with milk in his milk course, translate into the flavour of granola. 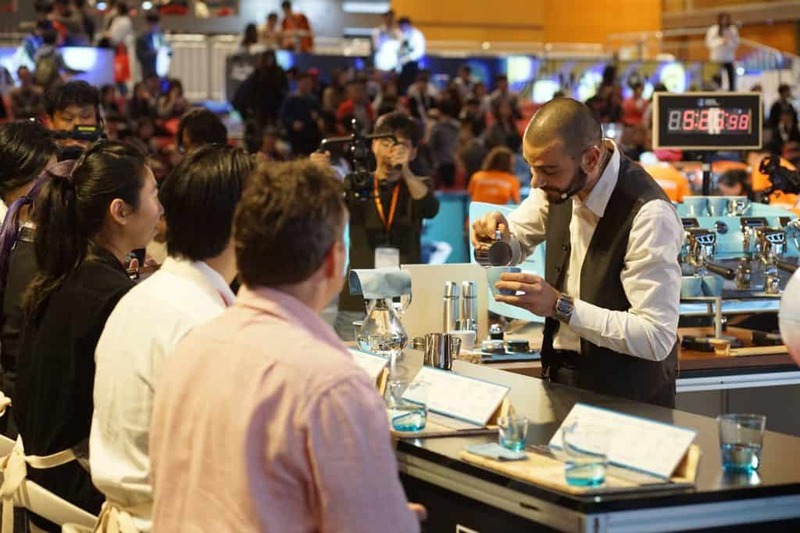 Dale delivered a very entertaining and paced presentation, using the stage set up fully to his advantage by opening up a second bar for the judges, to serve them the signature drink from. It was clear that a lot of work went into his presentation. A big applause to Dale for getting into the finals! This is our only European finalist and we have all the faith he will do an amazing job. Go, Dale! 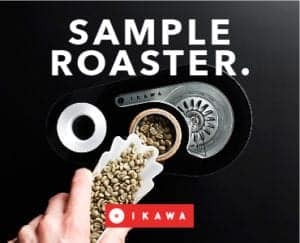 Andre brought an Ikawa roaster and nitrogen on stage to illustrate the benefits of flushing the ground coffee with nitrogen, a process he was inspired to do by a capsule coffee production which flushes the pods with nitrogen before filling. This increased his extraction yield and the TDS of his Geisha Finca El Puente, washed coffee from Honduras. 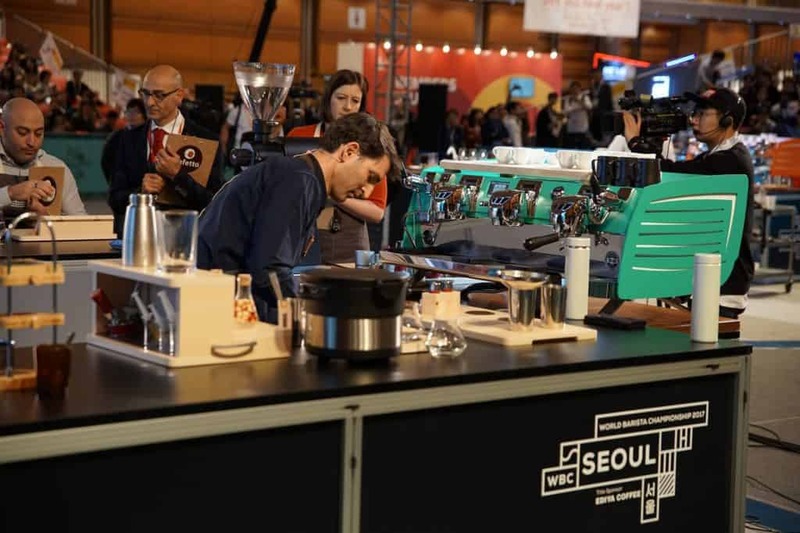 It also allowed him to use the freshly roasted coffee for his signature beverage while highlighting the pleasant orange flavour that appeared right after roasting. The use of nitrogen was also explained as a way of dealing with the negative and positive feedback from customers. 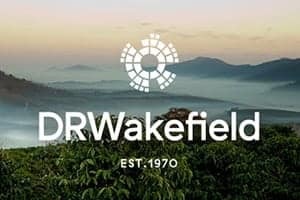 A negative feedback is usually a reaction to the results of roasting caused by carbonic acid, while a positive one is a reaction to high-intensity flavours that he wanted to retain in his cup. 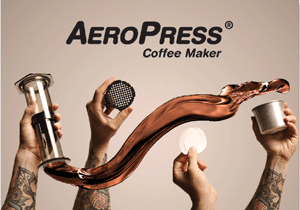 This was done exactly by pushing out the CO2 with a nitrogen flush prior to any further action with the coffee. Andre’s presentation was perfectly structured, with layers of information delivered at very timely spots, giving the judges always enough time to focus on the drinks in front of them. Andre is also one of the hardest working competitors we know. 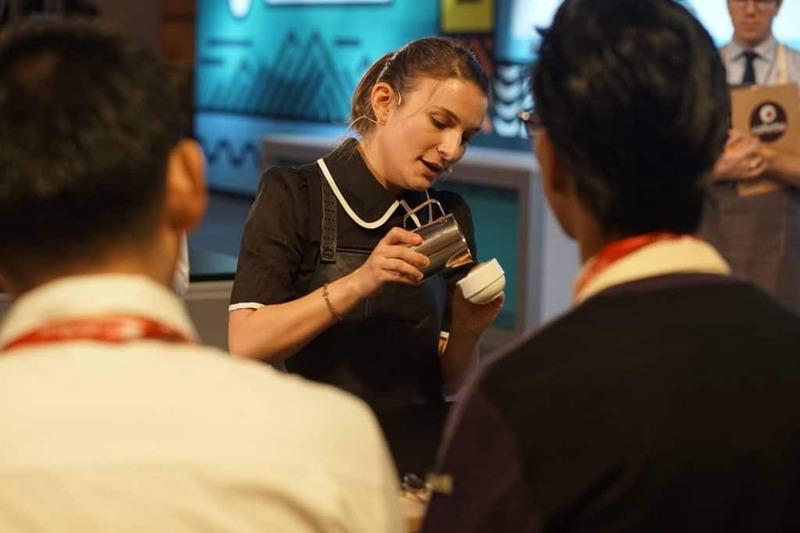 Lavinia’s presentation was about exploring the flavour profiles of two incredible coffees, standing out on their own, but also complimenting one another perfectly, in the conditions that Lavinia brought to the stage. 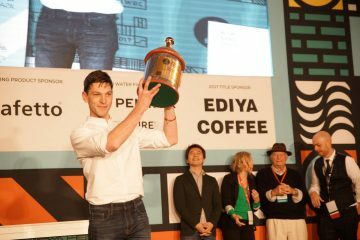 Champion of Romania brought a blend of two Ninety Plus coffees, a washed Ethiopian Heirloom Nekisse and a Panamanian Geisha, naturally processed. Her blend consisted of 65% Ethiopian and 35% Panamanian coffees. The components of the blend were roasted at different stages and then blended together. 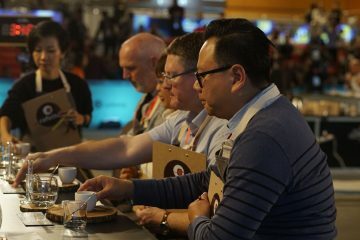 With milk, the quite long espresso was served in a milky beverage of 100 ml in total, one of the smallest milky beverages in the competition. It was great to see a young woman competitor from Europe, who has done an incredible amount of work on her own. Francesco’s presentation was centred around the theme of the adaptation of our industry to the climate changes in our world. 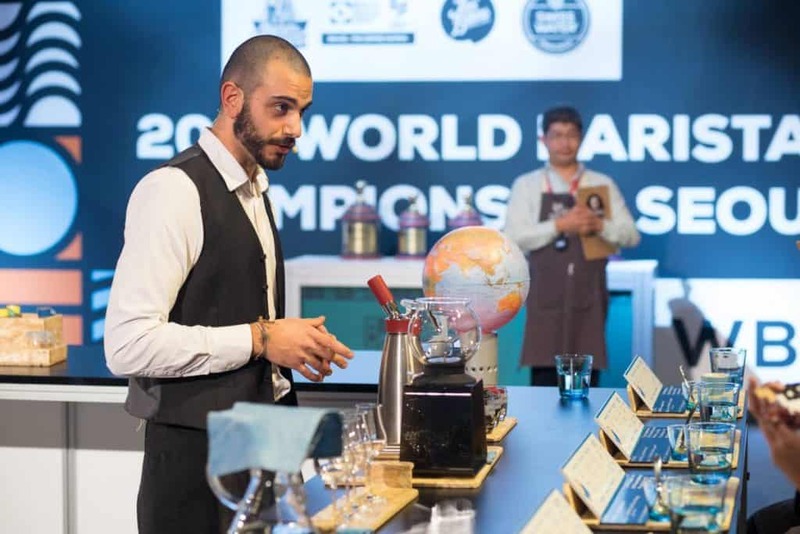 Through the three stages of his presentation—the milk beverage, espresso course and signature course—he pointed out the human adaptation, natural adaptation and a combined adaptation to the climate change, showing the incredible potential there is in re-discovering varietals and terroirs. 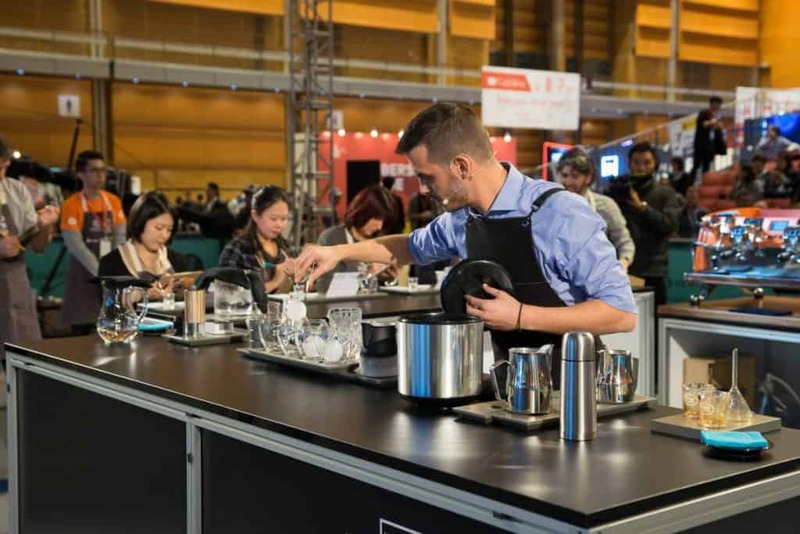 Francesco shock-froze his ground coffee on stage, before using it in his signature drink, to increase sweetness and tactile qualities in the cup, for instance. 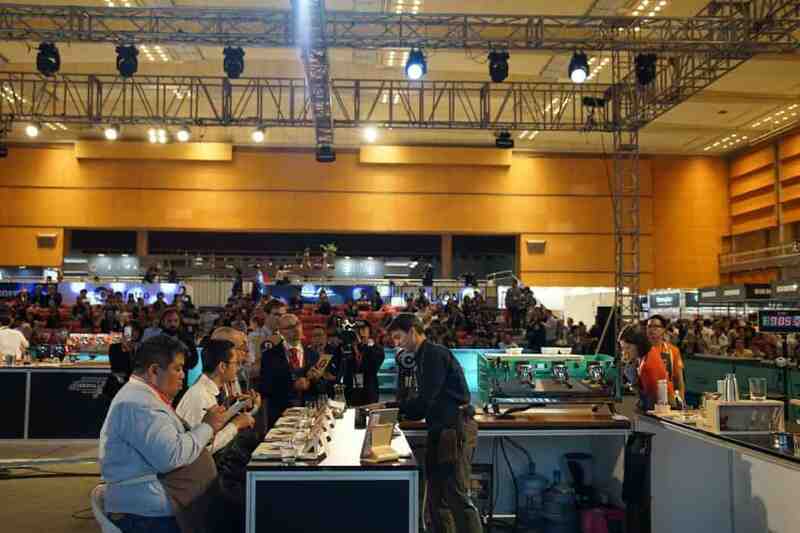 He used three different coffees: Costa Rican El Diamante, Colombian Sidra variety and an SL28 from Colombia. El Diamante, processed in an anaerobic fermentation process, showed the human adaptation to the changing climate. The Sidra is a hybrid between two older varieties, showing the adaptation of the variety to the terroir, while the SL28, originally grown in Kenya, is an example of both the nature and the human adapting to their new conditions, such as dry climate in Colombia, a country which originally was not the place for this variety to thrive in. Konstantinos presented his Ethiopian coffee from the Semeon Abay series, grown on the Magokoro estate, processed with Semeon Abay innovation technique of cold and hot fermentation. 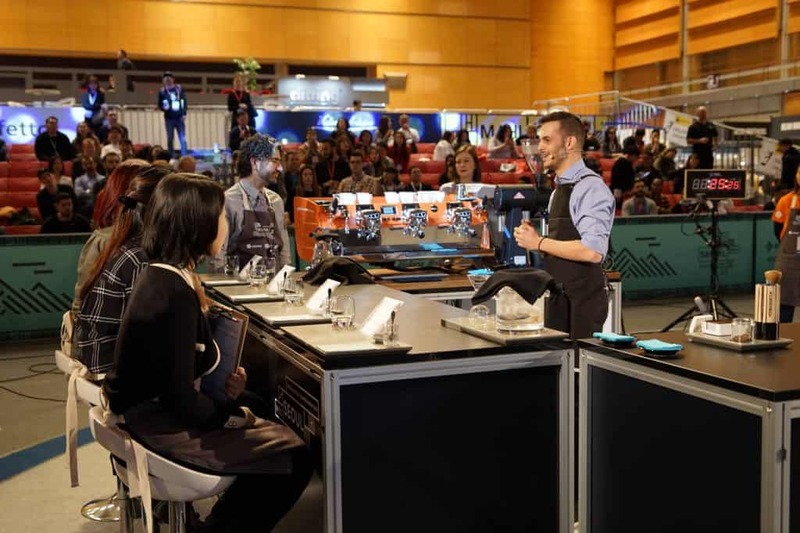 Not only did Konstantinos use this exceptional coffee, he also brought three innovations related to it in his routine. 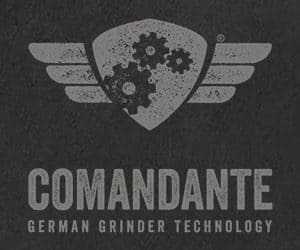 He pre-ground the coffee beans with a Comandante grinder to remove the silver skin that would cause bitter notes in the cup, but also to achieve more uniform particles. Konstantinos also cooled the beans down in the fridge before grinding them, which led the coffees to have more solids than if it was cooled down with a nitrogen. Thirdly, he ran the extraction for his espressos a bit longer, on a finer grind size, which suited the complexity of flavours of his coffee. 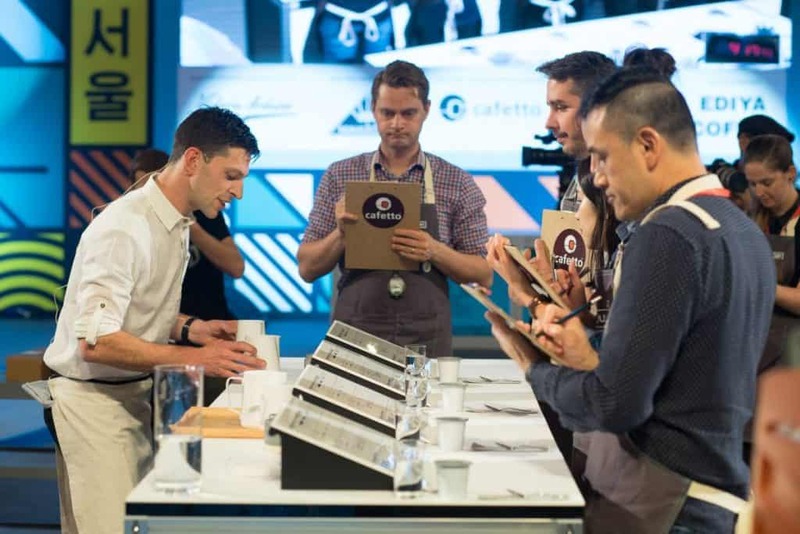 Tomorrow is the big final and we will be rooting for our European champion of the United Kingdom, Dale Harris of Hasbean Coffee. Make sure you tune in at 2:30 AM CET time for the first competitor, or at 6:15 AM CET time for Dale!